When I posted the recipe for the Wayside Inn Carrot Cake this summer, I mentioned a block party I attended with my folks. I love parties where everyone brings something – there’s always some “new to me” recipe to meet (along with a few friends! Hey, it’s not always all about the food!) This Citrus Vanilla Fruit Salad was one of them, and I just can’t seem to stop making it! This fruit salad was brought by some dear friends of my folks and I gravitated towards it immediately – a welcome change in a sea of wonderful (but not necessarily healthy) foods found at parties. Bright, fresh with just a hint of sweet and a touch of tang, the vanilla in the dressing just takes it over the top. Of course, I immediately asked for the recipe (which was seemed to be originally on AllRecipes) and have made it three times since, with just a few touches of my own. I especially like that the dressing will go so well with so many different fruits. I’ve even taken to making a batch of the dressing and when I need to round out a lunch or dinner, drizzling it over whatever fruit is on hand. I’ve also taken to changing up the flavor of vanilla a bit, here and there. One day found me drizzling in a little spiced rum instead of the vanilla; another adding in a little finely grated ginger. The possibilities are really only limited by your imagination – and good taste! 🙂 So think of this little recipe as a guideline. Now if you’ve been in the store and are tempted to pick up the-lovely precut packages of mixed fruits – don’t! Not if you’re budget conscious, anyway. Four to ten times as much as buying your own, they’re not a money saver. If you’d like to bring this in on a budget, though, rely on what’s on sale and what looks good, and fill your salad with the less expensive options, punctuating with a bit less of the pricier ones. (After all, that’s what the stores do, too, in their little precut packages.) Good old grapes and bananas are almost always inexpensive options, and are a bit chunkier, adding lots of volume. If you do have leftover fruit salad and it begins to look a little lackluster, don’t toss it! Instead, toss it in the blender with a little ice, juice or yogurt for the most wonderful smoothies! Talk about a leftover makeover! Bring juices and brown sugar to a boil in a saucepan over medium-high heat. Reduce heat to medium-low, and simmer until slightly thickened, about 5 minutes. Remove from heat, and stir in zest and vanilla extract. Set aside to cool. Note: while measurements don’t need to be exact, for best results you’ll need to be close. If your fruit is not very juicy, be prepared to squeeze another to get a good amount. 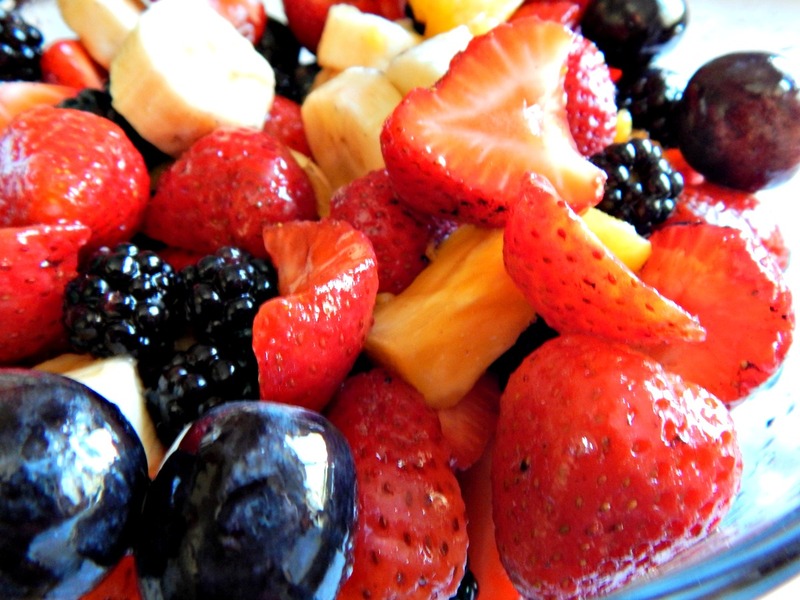 Fruit should be layered in a glass bowl with the sturdiest fruits on the bottom, then drizzled with the dressing. Toss just before serving. I’m bringing this to Fiesta Friday 90 put on by Angie of the Novice Gardener. The hosts this week are Effie @ Food Daydreaming and Lindy @ Lindy Mechefske. This entry was posted in Click here for Fabulous Food Posts and tagged Berries, Fruit, fruit salad, Salad, Salad Dressings. Bookmark the permalink. Yum, this looks so refreshing! My kids are big fruit eaters so I think they would love this! Thank you for sharing with us at #ThrowbackThursday we hope to see you again this week! What a beautiful fruit salad and what fantastic thing to bring to a potluck because as you say – not everything there is healthy even though it might be tempting. Perfect choice for FF! Lovely stuff Frau. It’s starting to get a bit cold over here and this type of salad would be nice as a refresher after a big hearty meal. Nice. Thanks, and it is so good – I guess I just haven’t been making these kinds of salads often enough!